#TakeBackTheTax condemns legal action against anti-crime activist, Yusuf Abramjee and research company Ipsos. The #TakeBackTheTax campaign against illegal cigarettes has condemned the R50-million defamation lawsuits launched against global research house Ipsos and #TakeBackTheTax spokesperson and prominent anti-crime activist Yusuf Abramjee by Gold Leaf Tobacco Corporation (GLTC). GLTC is a prominent player in the South African illegal cigarette market. The legal action comes after a July 2018 Ipsos study revealed that South Africa is losing over R8 billion per year in evaded taxes due to the exponential growth in illegal cigarettes. The study was carried out in order to quantify the nature and extent of the illegal cigarette trade in the country. The Ipsos research showed that almost 80% of all GLTC’s brands in the market were selling for below the minimum allowed price of R17.85 per pack – which only means one thing; they are not paying taxes – effectively breaking the law and robbing South Africa of billions of Rands in lost taxes. Ipsos also revealed that GLTC’s RG brand was the biggest brand in the market, selling for an average price of just R10 per pack, significantly below the minimum tax owed. In response to an illegal cigarette crisis threatening to spiral out of control, the #TakeBackTheTax campaign was launched last year. The campaign is aimed at encouraging government to act urgently in addressing the illegal trade. 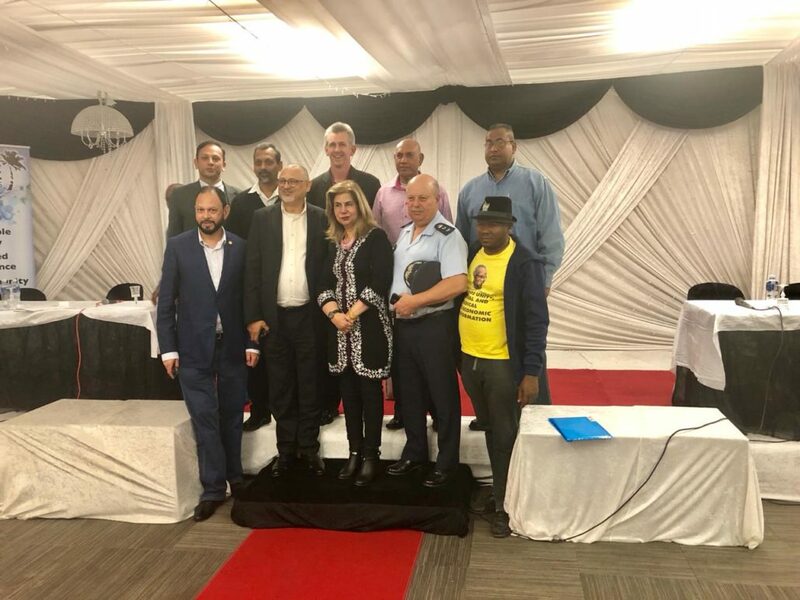 Yusuf Abramjee joined the campaign in September 2018 as its official spokesperson. In a style arguably reminiscent of American ‘SLAPP’ suits, where big companies attempt to silence and intimidate activists by levelling costly defamation suits against them, GLTC this year issued summonses to both Ipsos and Abramjee, for R50-million defamation claims. #TakeBackTheTax stands firmly behind the IPSOS research and its spokesperson. Abramjee himself remains firmly committed to fighting the scourge and impact of the illegal cigarette trade. The Ipsos study is the most robust scientific analysis of the multi-billion-rand illegal cigarette market ever carried out in South Africa. It simply cannot be ignored. Abramjee says as a result of this legal action #TakeBackTheTax now looks forward to a transparent and robust legal process that will compel manufacturers dealing in illegal cigarettes like Gold Leaf Tobacco to finally answer to the law. “These defamation suits are simply a ruse to deflect from the real crisis in the sector and to intimidate activists, like me, into silence” said Abramjee. “It is in the public interest for this case to be tried and ruled upon and we will take all necessary steps to ensure that it gets its hearing as swiftly as possible,” added Abramjee. 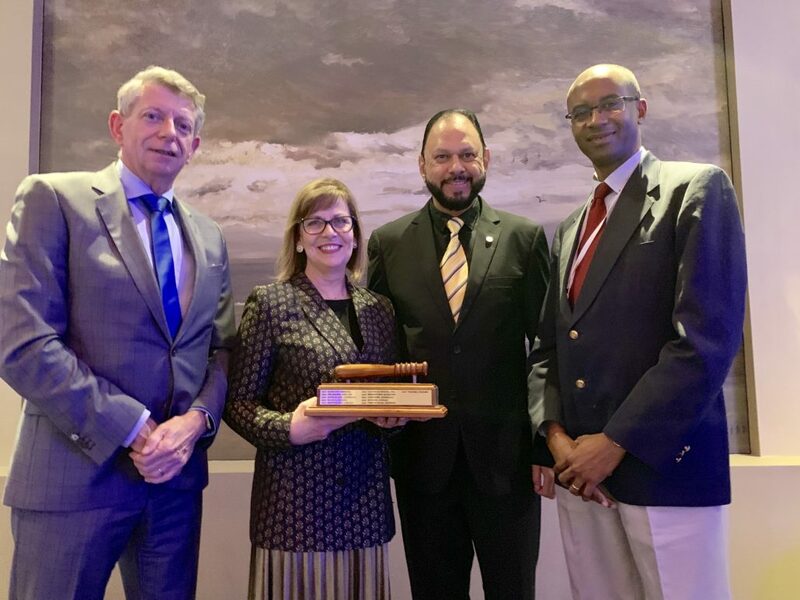 THE HAGUE, NETHERLANDS -At its 39th annual conference, Crime Stoppers International (CSI) announced Sharon Hanlon, Director from Region Five (Australia/New Zealand/South-East Asia) and Yusuf Abramjee, one of the Directors for Region Seven (South Africa) as elected President and Vice President to lead CSI. In the 40 years since Crime Stoppers began, this is the first time a woman has served as president. With more than two decades executive experience, Hanlon brings a unique and diverse perspective to the CSI leadership role. She’s led large-scale projects for government agencies and the private sector with a proven track record for contributing to cultural change, business strategy and corporate planning. Hanlon is well-versed in corporate governance thanks to her experience serving as the director for a number of public and private sector boards. She’s served in several Crime Stoppers leadership roles during the last decade and is currently Chair of Crime Stoppers South Australia Inc, Deputy Chairman Crime Stoppers Australia and after two and a half years as a CSI Director, is now President of CSI. Hanlon managed the Public Affairs Division for 10 years at the South Australian Royal Automobile Association on behalf of its 650,000 members. This provided her with significant exposure to working within federated models – both nationally and internationally – and saw her make important contributions to corporate governance, business strategy, public policy development and advocacy. Abramjee has been an anti-crime and social activist for many years. He is the Head of #MakeSASafe, Chief Ambassador of the Namola/DialDirect Safety App and Spokesperson for the #TaxBackBack campaign. 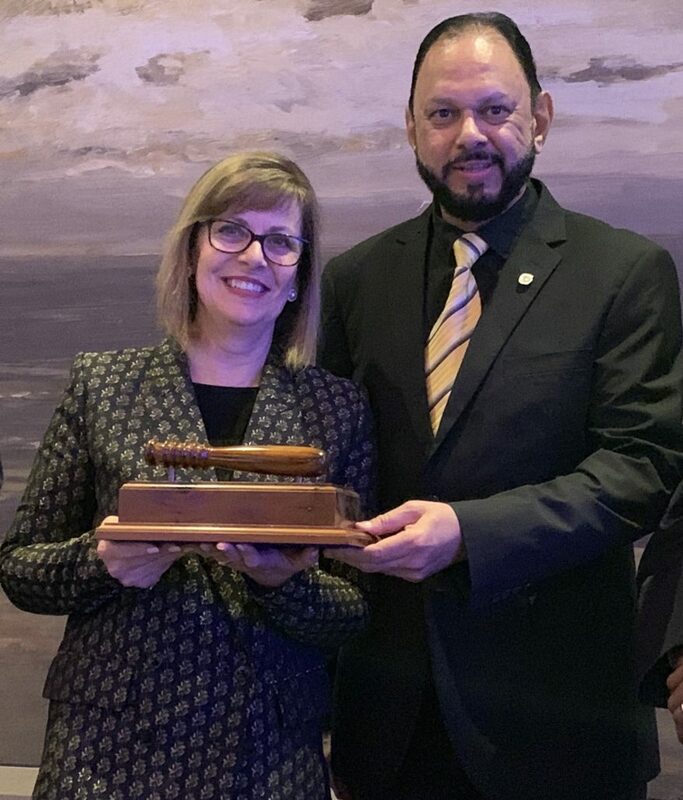 As a former teacher, crime reporter, crime editor, news editor, station manager, head of news and media executive, Abramjee has earned multiple awards for his tireless efforts to empower the citizens of South Africa to report criminal behavior, journalism, leadership and community activism. He received a National Order from the Government of South Africa in 2014. Abramjee’s penchant for engaging the public and exposing criminal activity will help CSI further its goals. “Fighting crime and creating a safer world has been and will always be close to my heart,” said Abramjee. “I fully understand the importance of communicating, networking, alliances and partnerships and making a difference. I look forward to serving CSI and our delegates in this new leadership role. I thank CSI directors and members for the confidence they have in me. I am humbled and honoured to be elected Vice President,” Abramjee added. Crime Stoppers International is the global authority on anonymous reporting and is the umbrella organization for approximately 800 certified Crime Stoppers programs operating in 26 different countries across seven geographic regions. Its mission is “to mobilize the world to report information on crime anonymously.” Since its founding in 1976, information provided through the network has led to more than one million arrests and 1.5 million cases solved. The group maintains a co-operation agreement with INTERPOL and has collaborative agreements with organizations such as the United Nations Office on Drugs and Crime (UNODC), the CNN Freedom Project (CNN), Airline Ambassadors International (AAI) and the International Police Training Institute (IPTI). For the full conference schedule visit www.CSIWorld.org. It’s time schools, both public and private, stopped targeting Muslim students. Our Constitution is clear! Here is the full legal opinion of the Department of Basic Education (DBE) on whether Muslim students are allowed to grow beards at schools. I raised the matter with Deputy Minister, Enver a Surtee, and I thank him for the assistance. The matter was brought to my attention by a parent. Your emails dated 18 and 30 September 2018 below refers. Section 7 has laid a standard pertaining to religious observance in schools and it is enforceable to both public and independent schools. To further provide clarity on this matter, one must not lose sight of the fact that the constitution applies both horizontal as against private institution and vertically against state organs. Independent schools are not exempted from complying with Chapter 2 of the Constitution and the department has a responsibility to respect, protect and promote it. Freedom of religion was further given content and meaning in the Pillay judgement by both the High Court and the Constitutional Court. In its judgment, the High Court1 (Kondile J with Tshabalala JP concurring) held that the conduct of the School was discriminatory against Sunali and was unfair in terms of the Equality Act. It held that our society prohibits both direct and indirect discrimination and aims to eliminate entrenched inequalities. It held further that the Equality Court had failed to consider properly the impact of the Constitution and the Equality Act on the Code and that both religion and culture are equally protected under the Equality Act and the Constitution. Because the nose stud had religious and/or cultural significance to Sunali, the failure to treat her differently from her peers amounted to withholding from her “the benefit, opportunity and advantage of enjoying fully [her] culture and/or of practising [her] religion” and therefore constituted indirect discrimination. The Court held further that the desire to maintain discipline in the School was not an acceptable reason for the prohibition as there was no evidence that wearing the nose stud had a disruptive effect on the smooth-running of the School. Although the Constitutional court set aside the decision of the high Court, it also declared that the decision of the Governing Body of Durban Girls’ High School to refuse Sunali Pillay an exemption from its Code of Conduct to allow her to wear a nose stud, discriminated unfairly against her. In compliance to the Constitution and Case law the school cannot prohibit a learner from practicing and observing a religion of their choice. Ashton College cannot determine a code of conduct in conflict with the above authority. With the multitude of emergency numbers available in South Africa getting help is not as clear cut as it should be. Adding to the frustration is the time wasted due to the lack of information available to the emergency operator. They don’t know who you are, or where you are. Namola, a free emergency safety app, supported by Dialdirect Insurance, takes the hassle out of getting help in an emergency. The moment a Namola user pushes the button to request assistance, the app sends through the user’s GPS location and emergency profile so that the user’s dedicated Namola operator knows immediately where the user is and who they are. With a quick confirmation of the nature of the emergency, the Namola operator will then coordinate the right help for the emergency and send the user the help they need. Thanks to innovative thinking, Namola uses technology to ensure that you are able to get help, no matter the scenario. For example, if a user can’t speak, Namola’s in-app chat feature allows an alternative method of communication with the Namola operator and the first responders. Even if the user is on the move, the GPS location will constantly be updated, giving South Africans peace of mind that no matter what the situation, they can let someone know that they need help. Namola knows that every emergency is different. In addition to having over 1400 geofenced control rooms on their database, Namola has added counselling services, social workers and community safety initiatives to the ways South Africans can get help. Recently, the company launched their latest innovation, Namola Watch, which allows established Neighbourhood Watch teams to respond to reported incidents in their communities faster than before. “Namola has changed the way that we are able to respond to emergencies in our community,” says Graham Holmquist of Riga Rescue, a Namola Watch Responder. Namola encourages South Africans not only to get help for themselves with Namola, but to use it as a trusted resource to get others in your community help. *Yusuf Abramjee is the Chief Ambassador for the Namola/DialDirect safety app and an anti-crime activist. The business community of Shallcross outside Durban met with the leaders of the “Bottle Brush” informal settlement, the Deputy Mayor of eThekwini, municipal officials, civic leaders, senior police officers, representatives of the community policing forum and anti-crime activists to discuss safety, security and service delivery issues. The meeting was hosted by the Oasis Group, owners of the Mall, The Ridge @ Shallcross. Some of the problems include poor lighting, lack of police visibility, dumping of refuse, and protest action against the lack of service delivery which contributed to the false perception that the area is not safe. Ebrahim said the mall “was extremely safe. Not a single robbery or theft of vehicles have been reported over the past few years. We pride ourselves on providing our shoppers with top security,” he said. Lucky Zulu, one of the leaders of “Bottle Brush” echoed Ebrahim’s sentiments saying that the Mall and the community have an inter-dependant relationship and cooperation is an imperative. Deputy Mayor of eThekwini, Councillor Fawzia Peer, said the issues raised by the community were being addressed. The municipality said high-rise electricity masts are to be erected in the informal settlement. The electrification of the area will also start in phases. Residents called for more police visibility along the Link Road. The Community Police Forum and the SAPS undertook to finalize a programme. “Patrollers along the road is an option and we are looking at it,” said Peer. A call was also made for a pedestrian bridge. The municipality undertook to explore it. 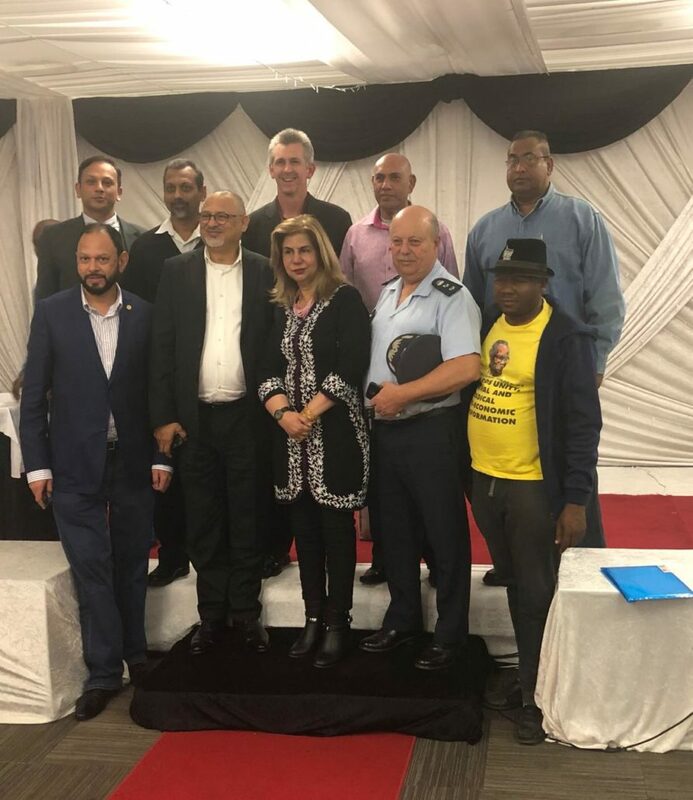 Elvis Govender, Chairman of the Moorten Chatsworth Community Policing Forum said that “service delivery by the municipality needs to be prioritised in the provision of waste removal facilities and services”. Falakhe Mhlongo, Secretary of the Ward Committee agreed that having a dedicated bin collection space be considered and that he would engage the Bottle Brush community to relocate some of the informal dwellings to enable services by the municipality. Social Activist, Yusuf Abramjee, said it was necessary for all sectors of society to work together. 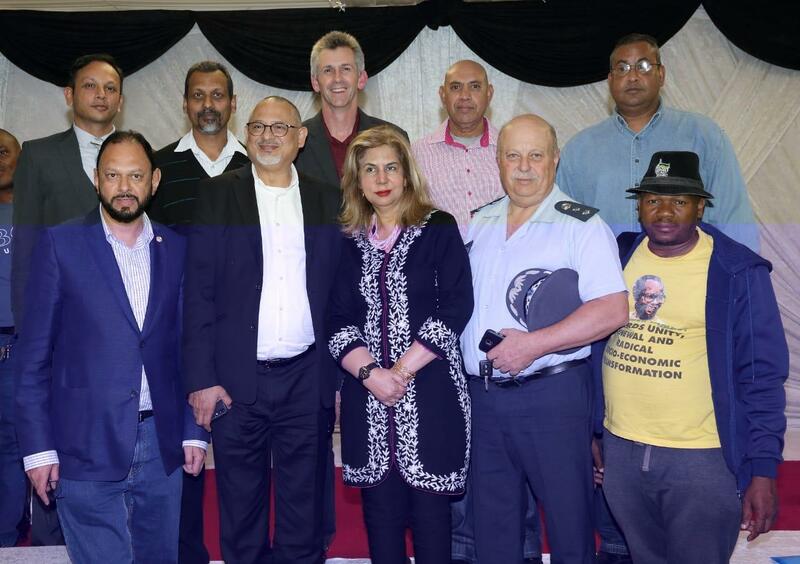 Abramjee appealed to residents to use the Namola/Dial Direct Safety App to report crime. It can be downloaded for free. He said residents should also use the app to report illegal electricity connections. “We have a problem in this area also and the power often goes out because of the illegal connections. “We will pass the information on to the eThekwini municipality and ask them to act,” said Abramjee. Community leaders from “Bottle Brush” thanked the mall and Peer for taking their concerns seriously and promised to work hand-in-hand to improve conditions. Yusuf Abramjee, has opened criminal charges against a man for inciting violence and hatred on social media. Social cohesion advocate and anti-crime activist, Yusuf Abramjee, has opened criminal charges against a man for inciting violence and hatred on social media. 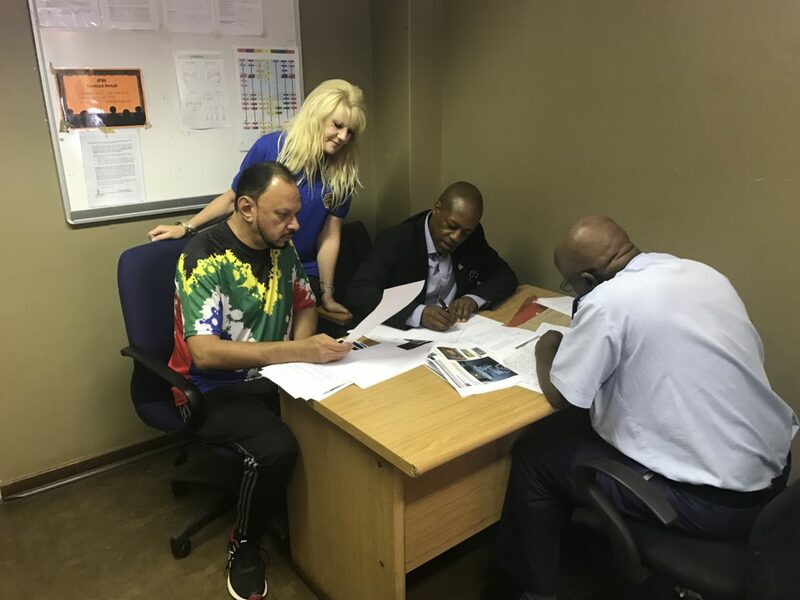 Abramjee, accompanied by Andy Mashaile, former Gauteng Community Police Board member, and an attorney, visited the Brooklyn Police Station to open charges charges against Obatala Mcambi at 11am today. Abramjee gave police copies of the man’s Facebook profile and screenshots of the posts. Mcambi poses with firearms and in one photo the serial number appears filed off. He also boasts large sums of cash on some of his photos. 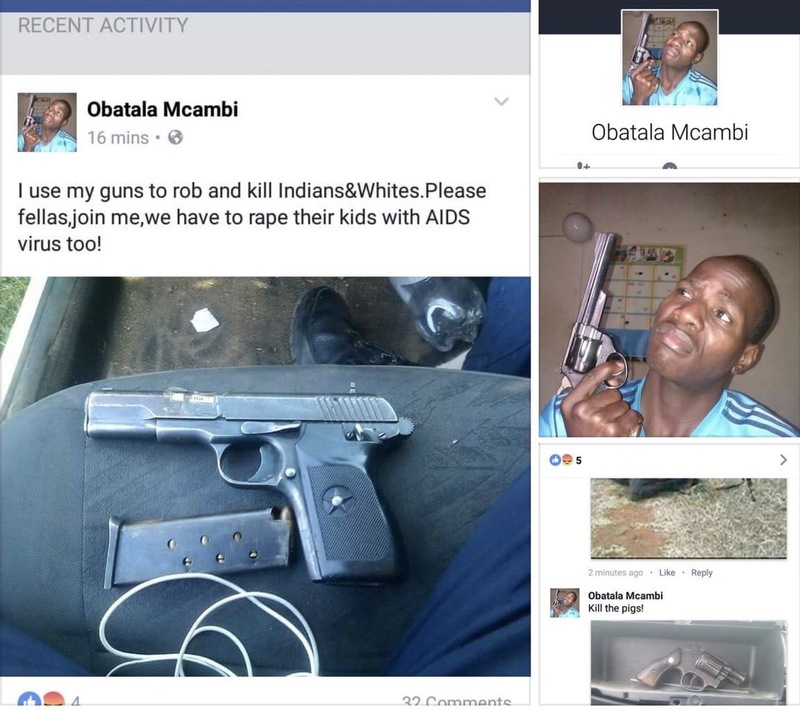 “I appeal to the South African Police Services to immediately investigate this matter and bring the person/persons responsible for the hate speech, incitement to violence and intimidation to justice. “I further request that a charge of hate speech, incitement and intimidation be opened and thoroughly investigated,” Abramjee added. Speaking to the media outside the police station, Abramjee said: “We are sick and tired of this nonsense. The law must come down hard on people like Mcambi. “He must be tracked down. Police must investigate the matter as one of urgency and we also need to establish whether Mcambi is his real name,” Abramjee said. Charges being opened at the Brooklyn Police Station today. “Mcambi updated his profile picture at 10.26pm last night with a photo of him with a revolver in his hand,” he added. Congratulations to the MJC – celebrating 72 years of serving the community. We salute the leadership of the council and we wish you well. It is disgraceful and hurtful to see Islamophobia on the rise – locally and internationally. Hatred for Muslims from some quarters is on the increase and the time has come for citizens to stand up, promote religious tolerance and take a stand against those who are targeting Islam. Islam is a religion of peace. Those who carry out violence, promote discord and hatred and kill the innocent in the name of our religion should be condemned and criticized at every corner. We need to ensure that we promote peace, love, reconciliation and compassion. We as South African Muslims should celebrate the fact that we enjoy religious freedom. Our Constitution guarantees us that. Although we are a minority in this country, we are able to exercise our religious rights freely and openly and that is something to be proud of. It’s something to celebrate. The recent attacks on three Mosques in the Western Cape is a disgrace. We strongly condemn the acts of those who want to sow division, promote religious intolerance and those who are out to destabilize our communities. We say: Shame on you. You will not succeed by throwing pigs heads and blood in our places of worship. My message to the culprits is clear: You will not succeed in your evil quest of tarnishing our religion. We remain hopeful that the law will come down hard on you – sooner or later. You nameless and faceless individuals should need be arrested, convicted and punished. You will eventually be exposed. It is concerning for us as Muslims to see an increase in objections to Mosques in many areas of South Africa. There seems to be a movement at work mobilizing to try to stop the building of Muslim places of worship. We have seen it in areas like Valhalla in Pretoria, Sandton and Buccleau and now Atholl in northern Johannesburg. The objectors use traffic and noise levels as a disguise to oppose the erection of Mosques. These same objectors will not make a noise when bottle stores, casinos and prostitution dens open right in their neighborhoods. But they mobilize when Muslims want to pray. This is a sad indictment on society. The time has come for all of us to show religious tolerance and to respect each other’s religions. We need Mosques, Churches, Temples and Synagogues side by side. We need to allow everyone the opportunity to pray and to exercise their religious freedoms. This will take us forward! We need to respect all religions. This week, I again saw a number of posts on social media in South Africa by individuals criticizing Muslims and Islam, insulting our beloved Prophet Muhammed (PBUH) and calling us, Muslims names. I don’t want to repeat some of the things said…It is sickening and nauseating. Such foul, nasty and odious attacks on our religion must stop. Institutions such as the South African Human Rights Commission (SAHRC), CRL Commission and the Equality Court must act decisively and with urgency and stop the hatred which which is being spitted out by some. They need to take stern action against those individuals who cause religious and cultural divisions. We need protection and we need it now. Early last year, I reported a number of individuals, during the height of the Valhalla Mosque Row to the CRL Commission for their Islamophobic comments on social media. They linked us to ISIS, Al Queda and Boko Haram. Many months later, I am still waiting for a ruling. I also reported a CRL Commissioner. We are still waiting for a ruling! The delays are unacceptable. The CRL Rights Commission is a constitutional body established in terms of the South African Constitution of 1996. Its constitutional mandate is to strengthen our constitutional democracy. But we need this Commission to act decisively to promote our religious, cultural and linguistic rights. We need them to be effective and I repeat: protect us. That’s what our Constitution dictates. Social cohesion needs to be promoted at every turn. It is the responsibly to of every citizen to do their bit. The time has come for all of us to promote the philosophy of active citizenry. This means we have to all stand up for our rights and roll up our sleeves. Recently, a young Cape Town woman was turned down from joining the South Africa Navy because she wears a Hijab. This is not right. It’s unacceptable. Individuals who want to exercise their religious obligations should be accommodated. I remain hopeful that the Navy will review its decision and allow Muslims women such as Taskeen Ebrahim to wear her Hijab with pride. I know the MJC has taken up her plight and I hope we will succeed. The so-called “Muslim Ban” by US President Donald Trump continues to draw attention and anger across the world. Trump, who clearly dislikes Mexicans and Muslims, is playing right into the hands of extremists. He is sadly giving them reason to continue carrying out acts of evil. We need bridges, not walls. We need love, not hate. Refugees seek refugee and shelter, not resentment or stigma. Trump is clearly xenophobic and we as South African Muslims join the world chorus to call on him to stop his madness. There is no place on our world for division and racism. Let’s all continue to do our bit to make the world a better place. Let’s join hands and unite. Let’s work together to promote peace, goodwill and social cohesion. Let’s help those in need. We have to unite. Our religious leaders must lead the way to fight social ills. Drugs, for example, are killing our people. Let’s use our podiums to inform and educate our congregations. Crime is on the increase. It’s time for all of us to work together and reclaim our streets from the gangsters. This is a powerful concept of teaching Muslims how to be responsible pro-active citizens. It instills social activism from an informed perspective. It promotes a Muslim citizenry aware of the power of influence and not just the influence of power. It helps in developing a caring, engaged Muslim citizenry using excellence to serve all of mankind. That is the practice of the seerah of our beloved Prophet (PBUH). That is the practice to profile our identity in a multi faith society. A practice to model the values of the Deen. A practice to advance our freedom in a culture fair way. It is time to “politicise our spirituality and spiritualise our politics” in a pro-active way. Let’s promote intra-Muslim solidarity and economic development and support and empower our community with the life skills to walk with self assuredness as Muslims underpinned by humility. Let me conclude by saying: All Muslims are not terrorists and extremists. We promote peace and we will continue to do so. A new multi-million rand state of the art library has opened it doors in Lansdowne Cape Town. The Al Ikhlaas Academia Library and Resource Centre was officially opened by Deputy Education Minister Enver Surtee. 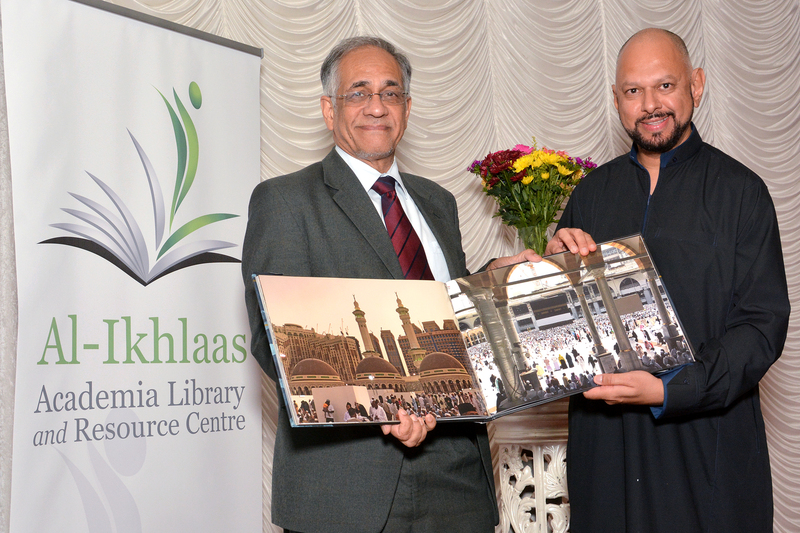 Social activist, Yusuf Abramjee, presented copies of his coffee table book #Hajj2016 #AbramjeeOnHajj to the library and to Surtee. He said hundreds of copies would be donated to libraries across South Africa. 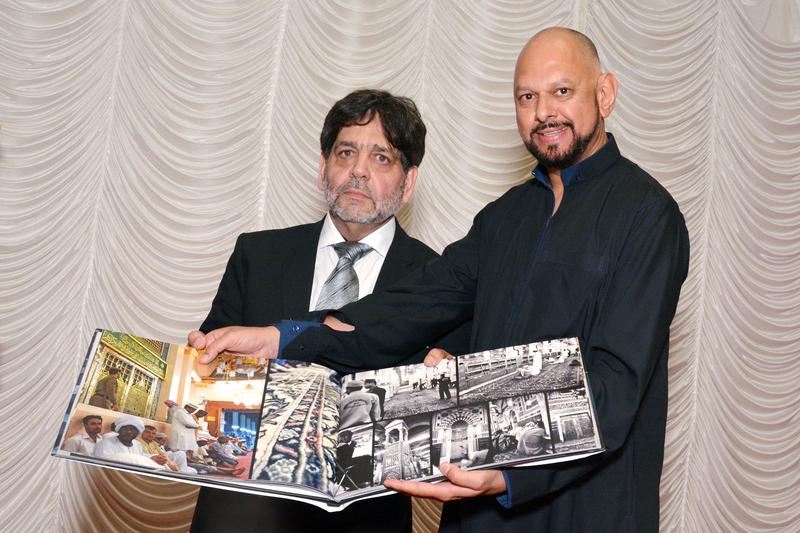 Abramjee announced that he and his publisher Yaseen Theba were looking at launching two new books in 2017- one on the Holy City of Makkah and another on Madinah. “We will capture the sights and sounds of both cities: the Grand Mosque, Prophet’s Mosque, historical sites, market places, etc. “We also looking to having the book in other languages including Arabic,” said Abramjee. #Hajj2016 #AbramjeeOnHajj has over 400 photographs of this years pilgrimage. Scores of books are being donated to libraries. Proceeds of the sale of the book are going to charities Awqaf SA and Crescent Lifestyle. *More on the library: call Dr Elias Parker, chairperson, on +27 (82) 4939331.